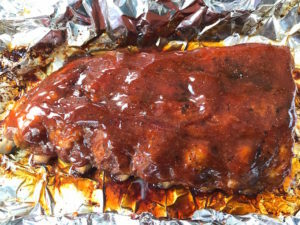 Tender, flavorful, Ultimate Oven Baked BBQ Ribs cooked low and slow. Rubbed with my Sweet and Spicy BBQ Rub and coated with my ten minute Sweet and Spicy BBQ Sauce. Perfection. All you need is some time and a good rub to bake tender flavorful ribs that easily pull away from the bone. You were probably expecting me to say fall off the bone, right? No. When the meat falls off the bone the ribs are overcooked. You now have pulled pork and not tender ribs. 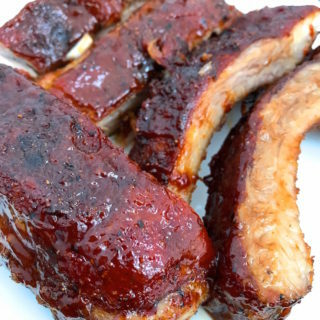 When eating ribs, I want the meat to be tender enough that biting into it cleanly and easily removes the meat from the bone. That’s completely different from taking a bite and having all the rib meat come off in one fell swoop. There’s tender and there’s over tender. Once my son picked up a rib to take a bite and all he meat fell off. He was left holding a bone with his mouth open. It was quite comical. The same thing goes for serving the ribs. You want to serve the ribs without it falling apart or having bones fall all over the place. The bones are dark grey and become brittle. Ever eat a rib and bite into a bone? Good sign it was overcooked. Here’s the thing. For perfectly delicious baby back ribs, don’t listen to all the slogans of “the meat falls off the bone”. Instead, aim for flavorful, tender, ribs. Ones you can sink your teeth into and have a tender chew. That, my friends, is a well cooked rib. 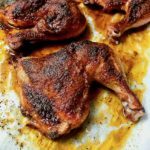 My version involves my Sweet and Spicy BBQ Rub and a Sweet Spicy BBQ Sauce easily made with a little of the rub and pantry ingredients. Mix together and it’s done. No need to cook anything. 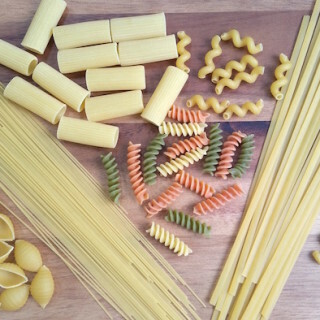 We are talking delicious but simple. 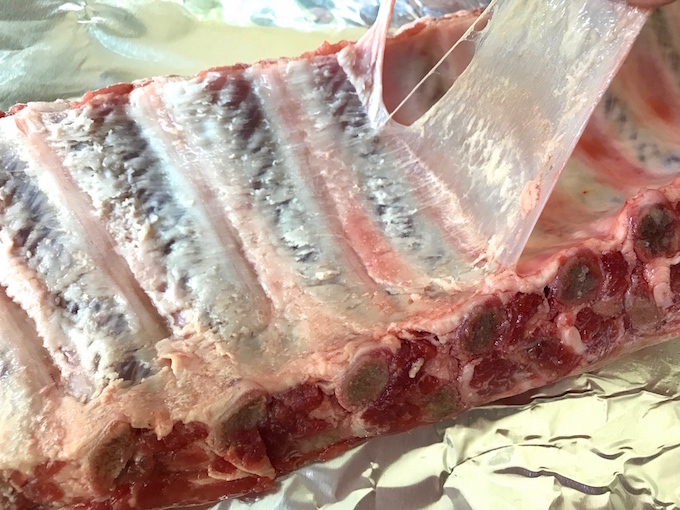 First thing you need to do is remove the membrane from the back of the ribs. You may find it was already done by your butcher. If not, then at one end of the rack, slide a knife under the membrane and over a bone. The membrane will tear apart from the back and loosen. Grab the membrane and pull off. You may need a paper towel to grab onto it because it can be slippery. The membrane should come off in one piece. Sprinkle rub all over ribs and massage it in. 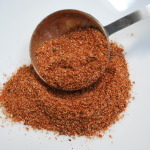 This is the same Sweet and Spicy BBQ Rub I use for my Oven Baked BBQ Pork Tenderloin. 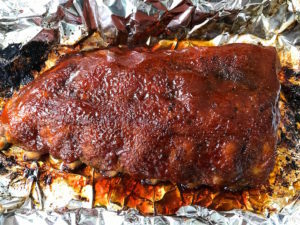 I’ve cooked these ribs naked (no foil) and wrapped in foil. Wrapping in foil steams the ribs and I personally feel steamed or boiled meat is great for soups, but not for ribs. I like the idea of keeping in moisture but tightly wrapping in foil keeps too much moisture that it boils the ribs. When unwrapping them you will notice the meat is greyish and soft which is unappealing. At that point your only option is to cover it in sauce because as is, it’s not something you want to sink your teeth into unless you’re into gray mushy meat. To get the best of both worlds, I loosely wrapped the ribs in foil then cut three or four slits to allow the steam to escape. Now you have moisture surrounding the meat yet allowing the excess to escape. No more boiled meat. 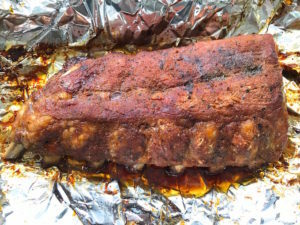 Place the ribs meat side up onto a foiled lined baking sheet to catch any leaks. After about 3 hours, remove ribs from oven. 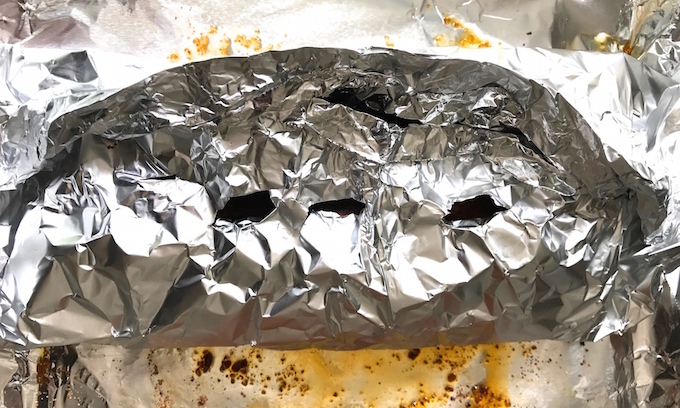 You will notice the slits in the foil keep the meat looking its best. At this point you can eat the ribs as is or place the ribs under a broiler for a few minutes to caramelize the sugar in the rub. 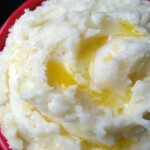 If you’re into sauce, here’s a simple one that takes 10 minutes to prepare. Just combine all the sauce ingredients in a small saucepan over medium high heat. The moment you see it start to bubble, lower the heat to medium low to prevent any splatter and cook, stirring every few minutes, for 10 minutes. Done. Coat the ribs to your liking with the BBQ sauce. You can finish the ribs under a broiler or finish them on the grill for a few minutes on each side until beautifully caramelized. These Ultimate Oven Baked BBQ Ribs are perfect for gatherings where you can place it in the oven and forget it for a few hours giving you time to be with your guests. The sauce and rub can be made ahead. The ribs can also be made ahead and finished under the broiler or on the grill until heated through and caramelized. The aroma of sweet spice will entice! Not gonna lie, they’re so good they’ll make you cry! Tears of joy will run down your face! Eat them slow, not fast in pace. Cleanup is easy there’s no mess. These ribs will bring you happiness! 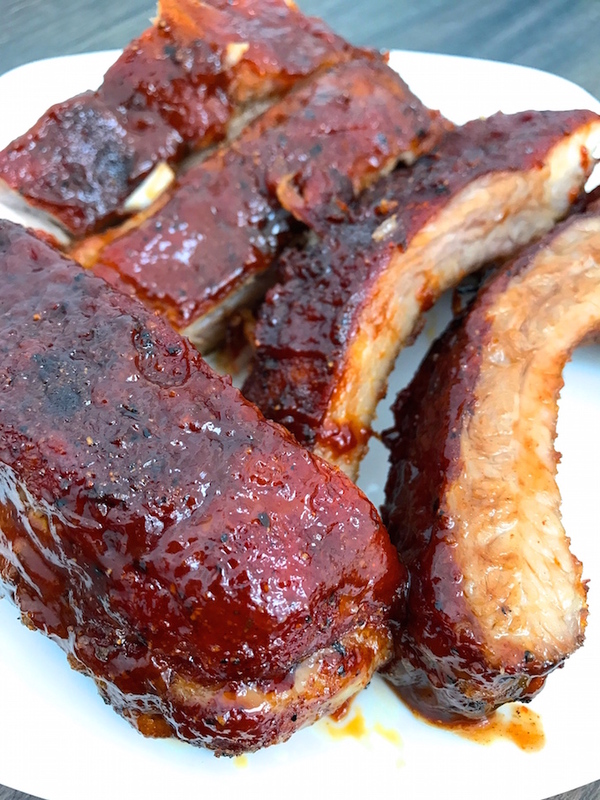 Tender, flavorful, Ultimate Oven Baked BBQ Ribs cooked low and slow. 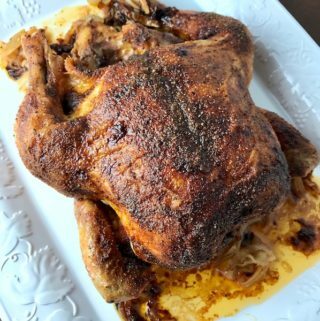 Rubbed with my Sweet and Spicy BBQ Rub and coated with my ten minute Sweet and Spicy BBQ Sauce. Perfection. Two racks will serve 4 - 6. Three racks will serve 6 - 8. Combine all Rub ingredients until thoroughly combined. Preheat oven to 275 degrees. If your oven is large enough to fit the baking sheets side by side while cooking then use the middle rack. If not, then arrange the oven racks to the lower and upper third of the oven and place a baking sheet on each rack. Line a baking sheet(s) with heavy duty foil. In a bowl, mix all the rub ingredients until combined. 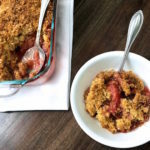 Remove the membrane on the back of the ribs if it hasn't already been removed. To remove, slide a knife just under the membrane on the corner of the rack to loosen. Grab the corner and pull it off. You may need a paper towel because it can be slippery. The membrane should come off in one piece. Discard membrane. I like to slice each rack in half between the bones to fit on baking sheet. If cooking 3 racks, you will need another baking sheet. Reserve ¼ cup Rub for sauce. Sprinkle rub all over ribs and massage it in. Wrap each half * (See Note) in foil then make 3 - 4 slits in top. Open the slits up slightly to allow the steam to escape. 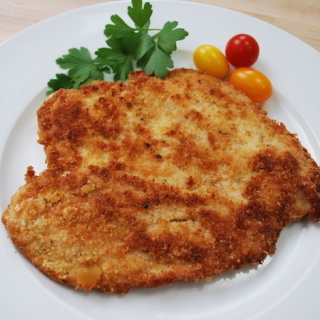 This will prevent your meat from overlooking and turning grey and mushy, but still benefit from moisture in cooking. 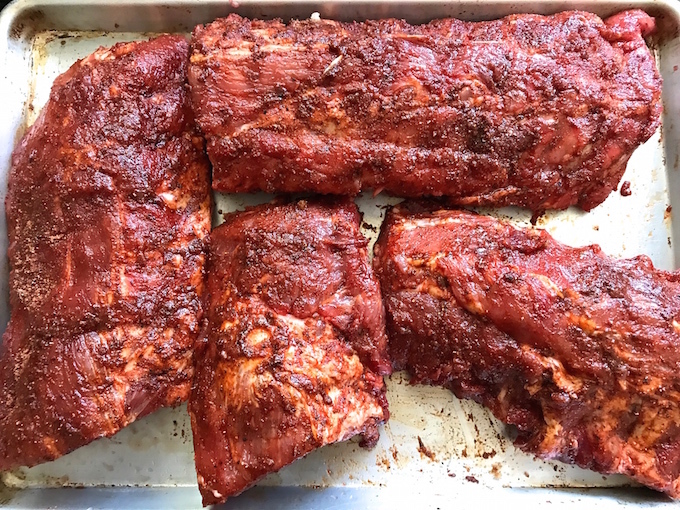 Place ribs on baking sheet(s) meat side up. Place in oven and bake for 3 hours. Combine all the sauce ingredients in a small saucepan over medium high heat. The moment you see it start to bubble, lower the heat to low to prevent any splatter and cook, stirring every few minutes, for 10 minutes. Remove ribs from oven. Unwrap and coat with the Sweet and Spicy BBQ Sauce. You can finish by placing ribs under the broiler for a few minutes until the top is caramelized. Or, you can finish on a medium high grill for about 5 - 10 minutes starting meat side down until beautifully caramelized. 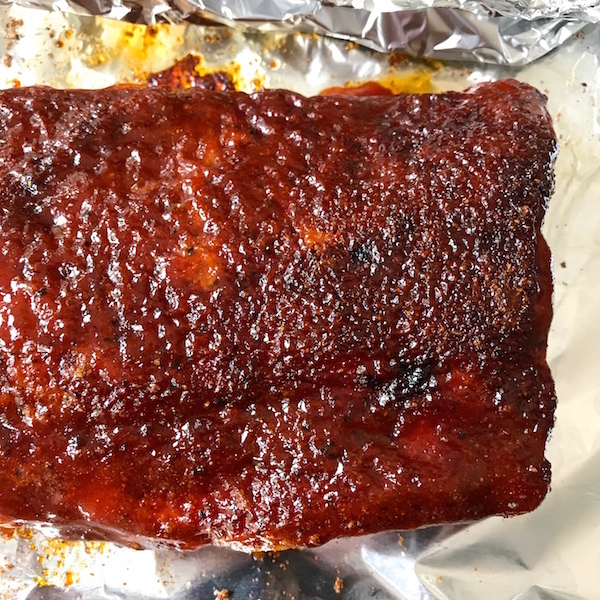 Wrapping each half in foil serves 2 purposes - the ribs are easier to handle when wrapped separately and each half slab is a serving. You can use the individual foil to hold the bones.